Canadian Rosie Cossar is a rhythmic gymnast who has represented Canada at the 2011 World Rhythmic Gymnastics Championships, the 2011 Pan American Games and the 2012 Summer Olympic Games held in London. But the 25-year-old athlete from Toronto, Ontario was keeping a heavy secret during her competitive career – she is a lesbian. Here is her compelling story. Brian Patrick: What are your favorite sports, Rosie, and what got you interested in sports originally? Rosie Cossar: My competitive sport was rhythmic gymnastics (RG). Since I retired I’ve played tennis, soccer, baseball, basketball, beach volleyball and skateboarding. I love the way playing sports makes me feel. It fulfills a part of me that nothing else can. I get such a high from playing sports and I feel empowered when I’m physically active. Getting together with my friends to play sports or engage in physical activity is one of my favorite things. BP: As a former world-class athlete, what do you consider your greatest athletic achievement as well as your greatest personal achievement? 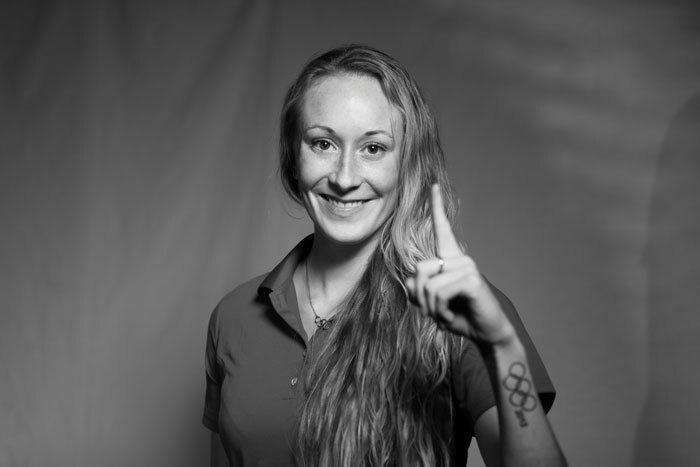 RC: Athletically, it’s being a three-time medalist at the Pan American Games and being an Olympian at the 2012 London Olympics. Personally, it’s being team captain of the first Canadian RG group to qualify for an Olympic Games. BP: I’ve watched your incredible presentation made to the International Olympic Academy in Greece this summer about your sports career and now, your advocacy work. Since, in some regards, it closely mirrors the experiences of other LGBTQ athletes who don’t have the same opportunity to speak publically, please share it with our readers. RC: I started RG when I was five-years old. The reason was one of convenience for my parents. My older sister Rachel was already attending RG classes so my parents could drop me off with her for three-hours-a-day to expend some of my endless energy. I attended RG lessons for three-hours-a-day, four-days-a-week. There’s something intriguing about me ending up in a sport like RG since it’s perhaps the most feminine sport out there and I was probably the biggest tomboy you’d ever meet. My first competition was when I was eight and that same year I travelled to a training camp in Moscow for what would be the first of many solo trips overseas in my career. BP: Traveling to Russia at such a young age must have been quite an experience. RC: It was a big step in my athletic journey since I was surrounded by the best athletes and coaches in the world. I was exposed to a caliber of RG that I had never seen before. While this sounds glamorous, I was completely on my own. I made the 10-hour flight without any of my family and was met by one of the coaches who accompanied me to the National RG Training Centre in Moscow. I was exposed to a level of difficulty far surpassing what I was used to. Here it was normal to spend the duration of training in tears, and here it was normal to be stretched so far beyond what you thought was your limit that you would end up screaming in pain. This was also the first time I was away from home, introducing me to the feeling of being homesick. This combination of factors made it a very eye-opening experience, the first of some very challenging obstacles I faced on my journey to the Olympic Games. Two years later at age 10, I again was on a flight wearing my “unaccompanied minor” badge. This time I was on my way to New Brunswick to train with one of the best and toughest coaches in Canada. But with every challenge I overcame, my development and success was exponential. The year before I was ranked 54th in our Canadian National Championships and after my first year with her, I jumped 50 places, ranking fourth at the following national championships. I remained on the Canadian National team for the rest of my RG career. The next six years were spent traveling the world from one competition and training camp to another – Russia, Belarus, Ukraine, Germany, Belgium, Japan – you name it. Despite how difficult it was to overcome the lifestyle hardships, I was very appreciative for having the opportunity to not only visit but actually live in such diverse parts of the world, experiencing so many of the world’s most rich and unique cultures. BP: When did the Olympics seem like a possible goal for you or was it a lifelong dream of yours? RC: No. When people ask me if I dreamed of the Olympics since I started so young, I realize I didn’t. In 2008 the Canadian RG federation came up with a plan to qualify our first group for an Olympic Games (OG) and I was chosen to be team captain. It wasn’t until we started the group project that I started to consider the possibility of going to an OG. No Canadian team had ever qualified. But as we climbed the ladder at international competitions, I was determined we would be the first. BP: That’s an amazing feat, Rosie. But what about your personal struggle that led to your sports diversity advocacy work. RC: I did face another challenge in sport, one that I feel is very important to talk about; the struggle over my sexual orientation, a subject that is too often left unspoken in sport. When I was 14- 15-years-old, I realized with great fear that I was different from everyone else – I was much more attracted to women than to men. This was terrifying because there’s a lot of expectation in the world in general. But specifically there is a lot of expectation in the world of sport, especially in a sport like RG where femininity is such a concentration. Both on and off the field, you are expected to perform in a way that represents there’s only one type of woman – a heterosexual woman, a straight woman. I wasn’t sure what that would do to my position in the sport. Could it potentially influence judging in a sport as subjective as RG, could it end my career or negatively impact my team? I began to feel I was being punished for something and would ask myself what I did to deserve this punishment. I thought long and hard about that question. I felt a huge weight on my shoulders since I wasn’t able to be myself. Instead, I was wearing a permanent mask. I had to pretend all the time, lie to everyone and make up stories to make it seem like I was the same as everyone else. This was exhausting. The amount of training I’ve done in my life does not compare to how exhausted this mask made me feel. Thank goodness, one day a thought miraculously came to me that I had been representing my teammates, my city, my province and my country – but I had not been representing myself. Knowing that I was going to compete at the Olympics, to become an Olympian, I knew with absolute certainty that I was not going to compete with this mask – I was going to honor the actual person who had been on this journey since she was five. There was no going back. I was going to be ME. I started to come out to my teammates and my coaches individually and yes, there were difficulties. But ultimately I was letting myself be free. So at the Olympic Games I was completely open; I had taken off my mask, my disguise. I was representing myself and I felt so free. BP: What have you been doing since your retirement and public coming out in 2014? RC: I am focusing all my being into LGBTQ+ inclusion in sport, dedicating my work to future generations of athletes so they don’t feel alone, scared and punished because of their sexual orientation. Nothing is more important to me than sharing a message of inclusion. I started not knowing a single gay person in the gymnastics world – I really felt I was the only gay person in the world. So I began sharing my story, opening up conversations with whomever I could to raise awareness about what LGBTQ+-identified athletes face in the world of sport. For a few years I volunteered all my spare time speaking at events that were willing to learn more about LGBTQ+ inclusion and now I find myself running the Canadian Olympic Committee’s LGBT Inclusion in Sport program! For this I am extremely grateful. BP: Congratulations, Rosie, and thanks so much for your dedication! Are you and your message being openly received in Canada? RC: Yes, I think because I’m a genuine person with a big heart and I care deeply about people. I believe that everyone deserves a happy life and I feel my purpose in this life is to encourage making a change in how people treat each other. There is a life that exists for gay people and it can be a good life. When I was young I spent so much time worrying about how I would be able to live my life as a lesbian, feeling that I would never meet another woman who would love me. I wish I could show my younger self where I am today, what I’ve built for myself and the work I’m doing in the LGBTQ world; also that I am comfortable in my skin now and indeed, have found that other gay people do exist! BP: Rosie, you really have found your purpose in this world and we’re all better for it. Thank you so much for sharing your story!